HUNTING -- A slight decrease in Panhandle Region moose permits is proposed for 2011, but hunters will could get the spice of two new mountain goat hunts. These and other 2011 Idaho trophy big-game hunting proposals have been released for public comment through Jan. 14. While moose tags will be increased in a few Panhandle units, they'll be reduced in others according to the proposals for a total of three fewer bull moose tags and five fewer antlerless moose tags, said Jim Hayden, Idaho Fish and Game Department regional wildlife manager. On the other hand, the Panhandle is proposed to have two additional goat hunts -- one in Unit 1 and one in Units 7 & 9 -- with one permit each. 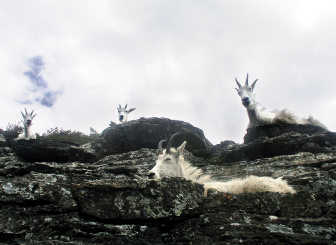 The Panhandle has more than 200 mountain mountain goats, Hayden said.